We've already seen the Volkswagen Golf R Mk 7 that Europeans are going to get, but now this is the one that's going to show up in VW's U.S. showrooms. According to the info, there's finally going to be a choice of transmissions. 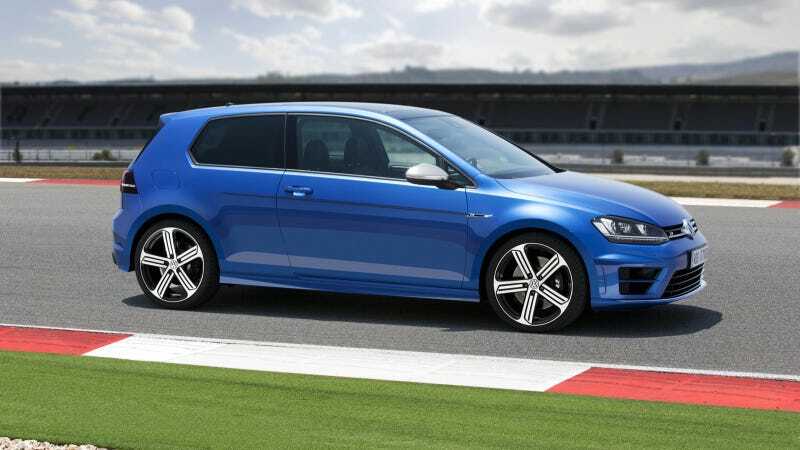 But the Golf R we get is still going to differ from the European market version in at least two noticeable ways. VW of America confirmed today that the 2015 Golf R is going to appear next week at the Detroit Auto Show in U.S. spec. It gets a highly boosted version of the 2015 GTI's 2.0-liter turbo four that makes 290 horses and is mated to an all-wheel drive system. Yes, that's six fewer horses than the Euro car. But the R still gets to 60 in 5.3 seconds with the six-speed manual, or 4.9 seconds with the DSG. That's an important distinction there. Since R Golfs started coming to the U.S. with the 2004 R32, VW of America has made the choice between a six-speed manual or a DSG for Americans. The Mk 7 car is the first we're getting that gives us the option. It's a big decision you have to make now. The six-speed manual is good and gets 31 MPG on the highway according to VW, 4 more than the current car. But the DSG is a good transmission, and makes the car quicker. One choice you won't have is between two or four doors. In another Golf R first, Americans have to go four-door or go home. VW of America giveth and taketh away. You'll have until early 2015 to decide whether or not that's going to stop you from buying one.